Protecting skin from sun damage at the pool, beach, or in humid climates is easy with Neutrogena Wet Skin Sunscreen Spray with Broad Spectrum SPF 85+. 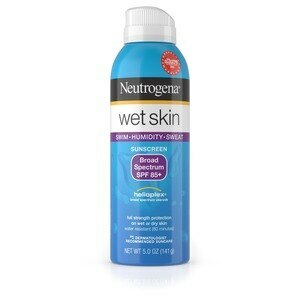 This convenient spray-on sunscreen cuts through water and applies directly to wet skin. On wet or dry skin, it forms a breathable protection to visibly repel water. This sunscreen is formulated with Helioplex Technology, which offers superior broad spectrum protection from aging UVA rays and burning UVB rays. This sunscreen spray is oil-free and PABA-free. Active Ingredients:. Avobenzone 3% (sunscreen). Homosalate 15% (sunscreen). Octisalate 5% (sunscreen). Octocrylene 10% (sunscreen). Oxybenzone 6% (sunscreen). . Inactive Ingredients: Acrylates/dimethicone copolymer, acrylates/octylacrylamide copolymer, alcohol denatured, ascorbyl palmitate, butyloctyl salicylate, cetyl dimethicone/bis-vinyl dimethicone crosspolymer, diethylhexyl 2,6-naphthalate, dimethicone, dimethyl ether, ethyl methicone, fragrance, nelumbo nucifera flower wax, octyldodecyl citrate crosspolymer, retinyl palmitate, tocopheryl acetate. Shake well before and frequently during use.Spray liberally and spread evenly by hand 15 minutes before sun exposure.Apply to all skin exposed to the sun.Hold container 4-6 inches from the skin to apply. Rub in. Do not spray directly into face. Spray on hands and then apply to face. Rub in.Do not apply in windy conditions.Use in a well-ventilated area.Reapply: After 80 minutes of swimming or sweating Immediately after towel dryingAt least every two hoursSun Protection Measures. Spending time in the sun increases your risk of skin cancer and early skin aging. To decrease this risk, regularly use a sunscreen with a broad spectrum SPF value of 15 or higher and other sun protection measures including: Limit time in the sun, especially from 10 a.m. 2 p.m. Wear long-sleeved shirts, pants, hats, and sunglassesChildren under six months of age: Ask a doctor. For external use only . Do not use on damaged or broken skin. When using this product keep out of eyes. Rinse with water to remove. Stop use and ask a doctor if rash occurs. Keep out of reach of children. If swallowed, get medical help or contact a Poison Control Center right away. Danger: Flammable. Contents under pressure. Do not use near fire, heat or while smoking. Do not puncture or incinerate. Store at temperature below 120ºF (48ºC). Use only as directed. Intentional misuse by deliberately concentrating and inhaling the contents can be harmful or fatal.